I'm releasing this post a few days earlier than usual, as I'll be on the road trip for this eclipse at the regularly scheduled posting time. Also, this post has been cross-posted on my church's blog. 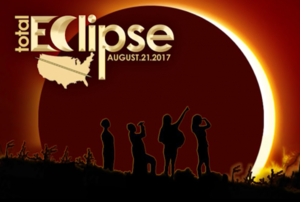 God will do something great and marvelous on August 21, 2017: there will be a total eclipse of the sun over the United States, going clear across the country from the Pacific to the Atlantic oceans. A group of us from Tribe church will be travelling to Oregon to see it. I first learned about eclipses as a child in South Korea. I learned that you'd have to wait hundreds of years to see a total solar eclipse, if you waited at a single spot on earth. So I despaired of ever seeing one - for South Korea is a small country and I didn't think I'd get to leave it, let alone dare dream of ever living in America. And yet, by the grace of God, through the working of his mighty hand and his outstretched arm, here I am in America. Seriously, the events surrounding my family's immigration here were miracles - my parents can talk for hours about it. And now that I'm here, I get to witness this eclipse, which some in the past may have called another miracle. But the two types of miracles that I mentioned above are quite different. I think that people have interesting perceptions about that word, "miracle", tied in with their perceptions about God. Many of us have the idea that a miracle is something that God does for us to demonstrate that he loves us. He may miraculously give us a new job, or heal us of our sickness, match us with our husband or wife, or bring us over to America. And of course, God does work in all those ways. Through these events we learn that God cares for us in an intimate, immediate, personal way. But a eclipse is not really like that. It's not a "miracle" in that sense. A number of you know people who couldn't travel to see the eclipse because it was happening on the first day of school. Some others had other similarly important engagements. Wouldn't it be nice if all these schedules could be worked around, so that all these people could see the eclipse? Well, no - it wouldn't be nice. The eclipse doesn't care about your schedules. The nature - and indeed, the very attraction and beauty - of celestial events is that none of our earthly finagling here below can influence them one whit. It is distant and impersonal. So what does a "miracle" like this eclipse teach us about God? It shows us his grandeur. The heavens declare the glory of God, and the firmament proclaims his handiwork. That very immutable, adamantine quality of the eclipse says that God is beyond anything that humans can control, and reminds us that he's the creator and sustainer of the whole universe. Some may say that this solar eclipse is not a miracle, because it's been explained by science. But this is a shallow thought. Look up to to the heavens and see: who created all these? The very logic and elegance of science which explains celestial mechanics is but an aspect of God's character: it is he who brings out the starry hosts one by one. Because of his great power and mighty strength, not one of them is missing. And as our sciences advance, they will only become better testimonies to that power and strength. So you see, the miracle in this eclipse is not just about this one event. It's not just this one spectacle, as neat as it may be. It teaches us something about God. It allows us to say, "this is how the Creator made the universe. This is what he's like." So we have two types of miracles: the intimate, personal kind, like the answering of a prayer, and the grand, immutable kind, like this eclipse. I think many people have a perception of God which is unbalanced towards one of these kinds of miracles. They tend to think of him mainly (or merely) as an intimate confidant and friend, or merely as the impersonal, immutable Creator of the universe. This is not a bad thing, per se. We must all start somewhere, and we can't learn multiple things about God all at once. But it is a joy to begin to understand and harmonize your different perceptions of God; to realize that the same God whom you prayed to as a child and comforted you in your grief is also the God who directs the heavenly bodies to cause this eclipse. It's like finding out that your lover is also the sovereign of a mighty empire, or learning that the richest person in the world wants to be your buddy. These are not different beings: the Lord our God is One. In Christ Jesus dwells the fullness of the Creator, and he calls us his friends. And in this way, I hope that this eclipse is still a miracle for you. I hope that through it, God reveals to you a little bit more of what he's like. And I pray that you come to that intimate, personal knowledge of the ultimate, immutable, timeless One.